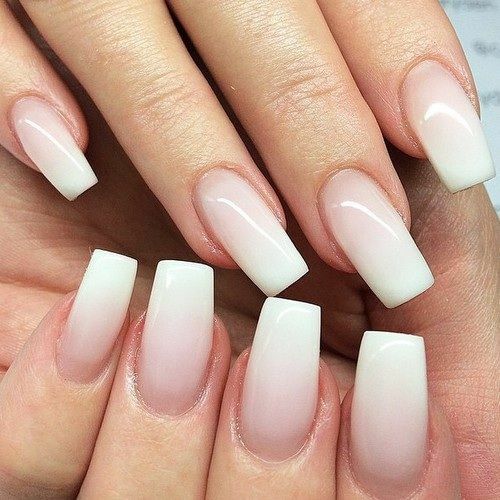 French tip nails are such a cool trend among women of all ages. We all want to have beautiful, long, and gracious hands, which means our best alternative is to opt for French tip nails. The classic design has evolved, and it has been completed transformed from something simple into something incredibly sophisticated and chic. There’s a design choice for every occasion, so whether you’re going to a wedding or you just want to have beautiful nails for a day at the office, these 60 French tip nail designs should serve as inspiration. Natural nails are the best. For this design you don’t need artificial nails. Just your natural nails grow a bit, and give them a round shape. 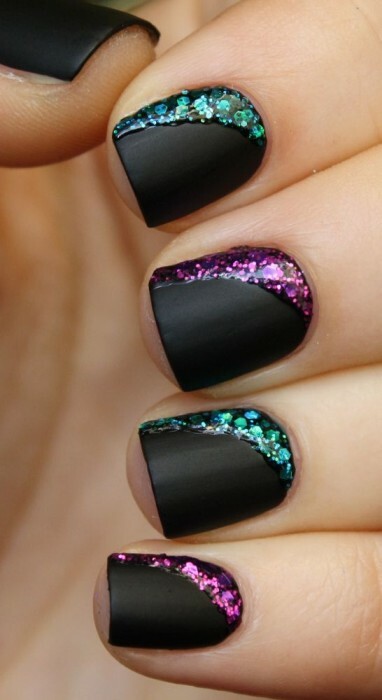 Use black nail polish only for the extra length, and pastel pink for the base. The final result will look refined and chic; perfect for every occasion. This beautiful manicure is excellent for a wedding. The French design has a classic square shape, and the nails are slightly longer. Perfectly trimmed and colored with white matte nail polish, the final coat of polish is sheer but sparkly. This gives the manicure an original and extremely enticing allure. 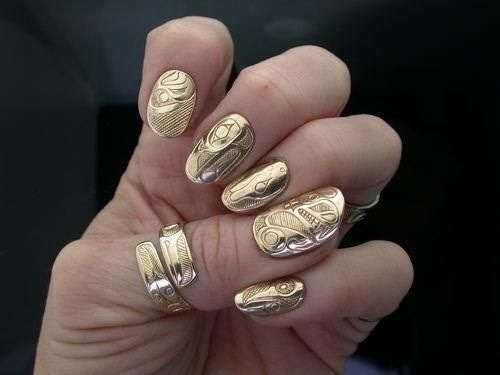 French tips nails with metallic designs are the newest trend. Basically, we have a matte gray polish for actual nails, and sparkly silver for the tips. 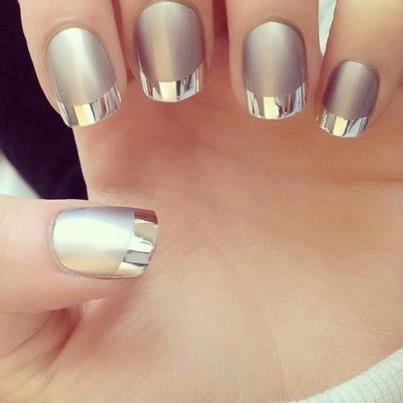 If you’re going to a fancy part or live concert, this metallic French manicure will surely turn some heads around. 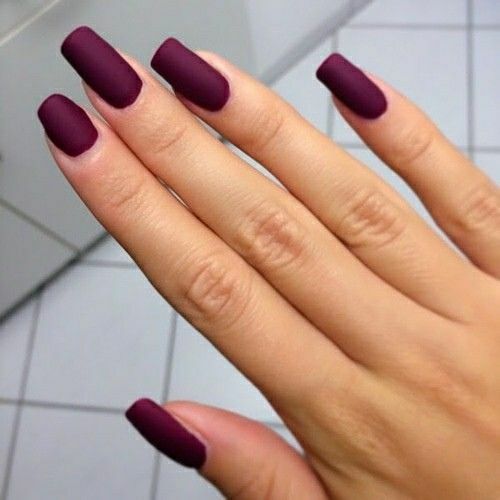 Matte nails are chic and modern, and they go really well with elegant, extravagant clothes. However, be careful as matte polish can be incredibly sensitive too. Opt for classic square-shaped nails, and consider an extended length if you have bulkier or shorter hands. 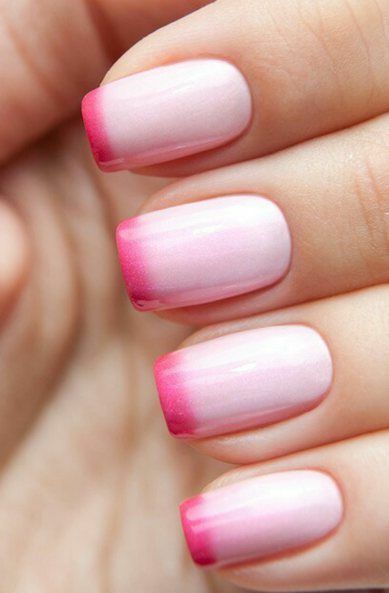 This French tip nail design will take your breath away. 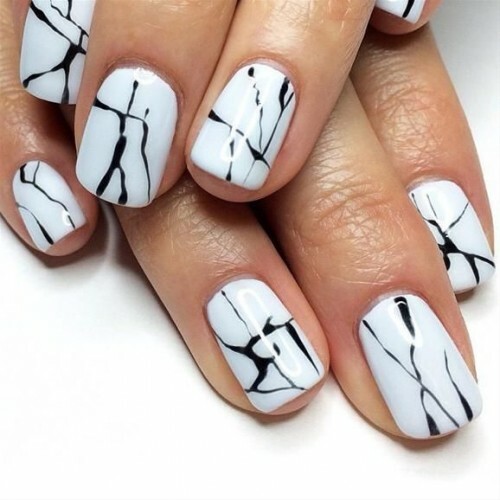 Basically, each nail tells a story and we really like the black & white allure. 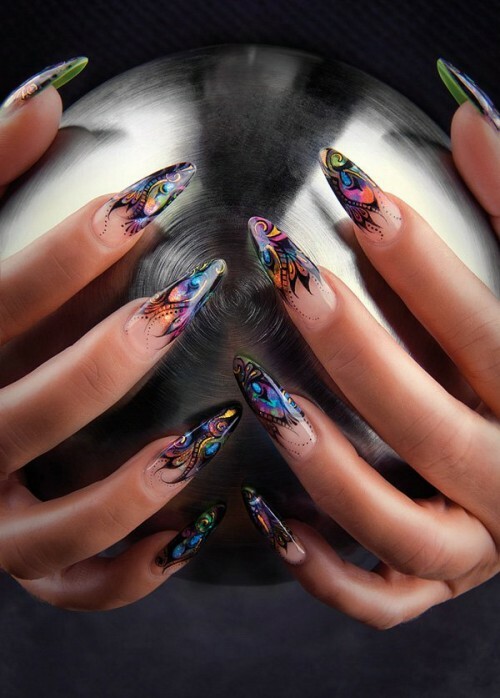 Artistic nail designs are becoming increasingly more popular, and we must emphasize that it is a great way of conveying a powerful message too. Aztec designs make the greatest impact. Perfect for women with both short and long nails, this type of manicure is excellent for free-spirited women. Consider colorful patterns and pair the design with a cool, outgoing outfit in order to free chic and elegant. 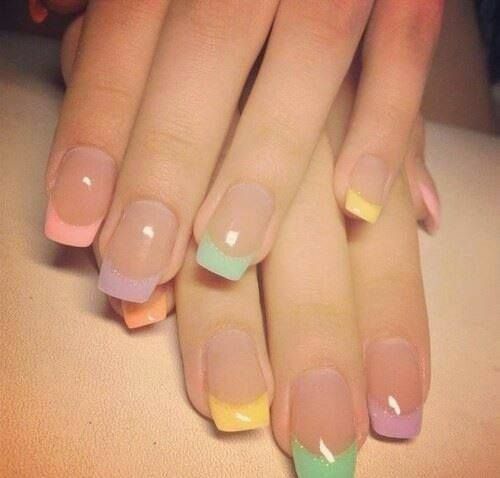 Pastel nuances for the tips are great for a summer-inspired manicure. The French design is neat and simple at the base with an added twist thanks to the light purple, yellow, mint green and pink influences; wear the nails round or square, and let your hands grab attention. 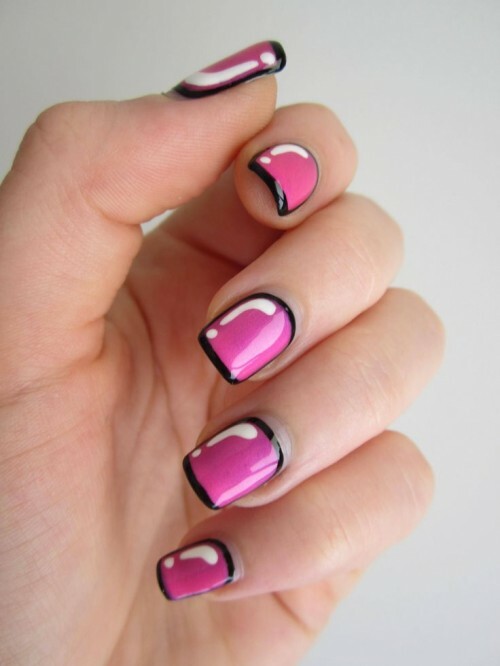 Surprisingly smart and playful, this nail art design blends two main contrasting pinks. The wow effect is guaranteed, mostly because each nail is differently designed with the color combo; an excellent idea for women who want add a twist to their daily French manicure. 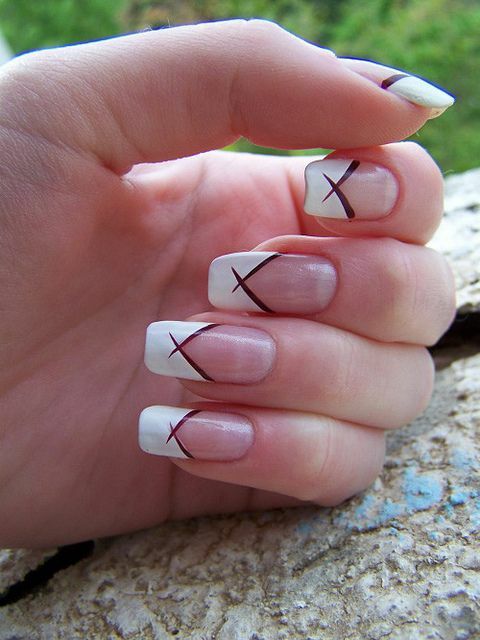 This French tip nail design is exceptional. Aimed at sophisticated women, the manicure is ideal for a lavish party or masquerade. 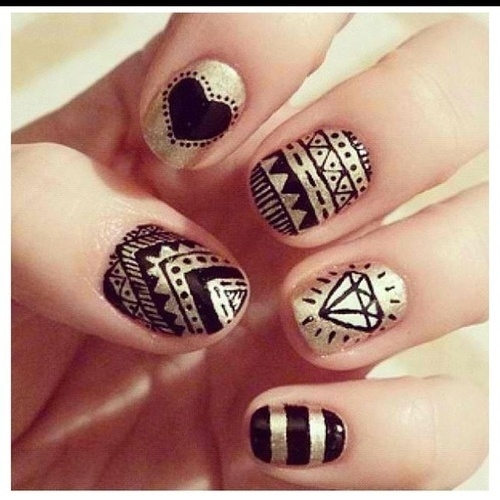 We really love the graphic patterns drawn on the nails – absolutely stunning. This fascinating nail design is both elegant and discreet. 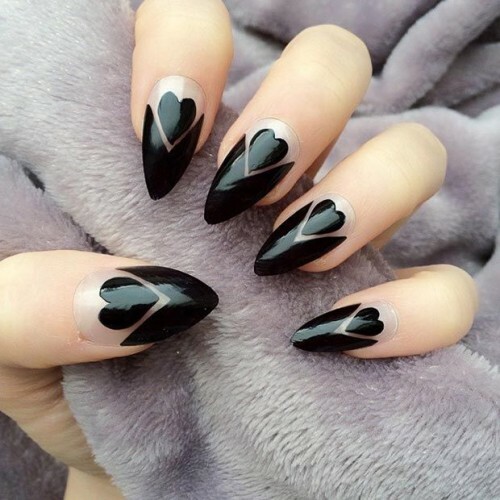 We love the stiletto shape of the nail, as well as the geometric contour of the black nail polish. This interesting French manicure is both striking and stylish. 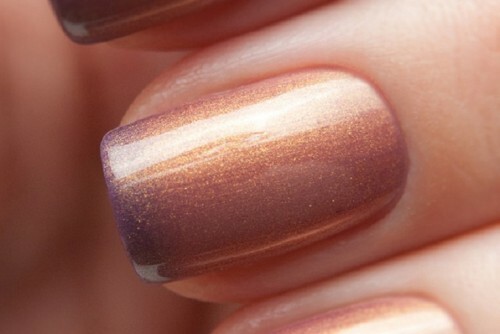 Gray is a rather unusual nuance for nail polish, although in combination with light pink, it does look quite appealing. Sometimes the simplest design can have the most striking effect. 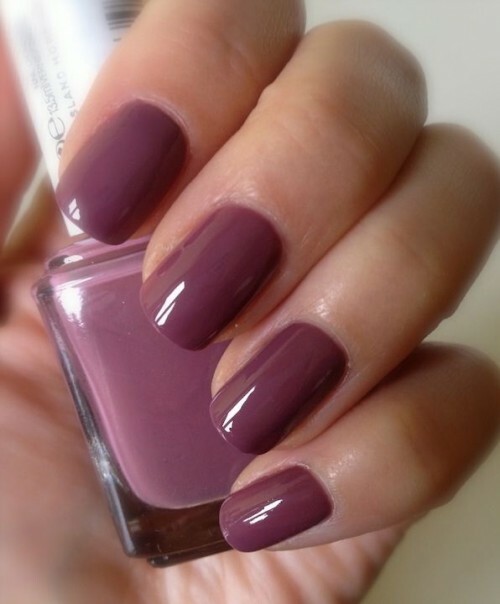 Dark purple can be so attractive when it is topped with a coat of invisible nail polish. This fabulous combination of sparkling cherry with warm purple is suitable to women who are more sophisticated. The pointed tips add even more glam and opulence to the overall manicure. A French tip nail design you must try at least once! This is a classic type of French manicure with a twist. We really love the glittery gold nail polish used for the ring finger. The French design is perfect for brides-to-be. Classic, elegant and stylish! What more can you ask for? Let the rock-star in you shine through and opt for this bold French tip nail design. 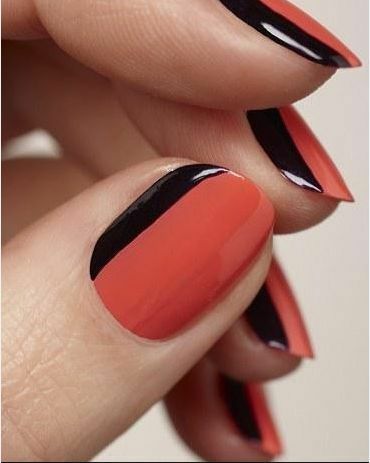 We love the matte and gloss combination; it adds originality to the manicure, and it makes it stand out. Adorable nails! That’s everything we can say about this design. Those cute black bows placed at the base of the tips really make this French manicure seem original and incredibly enticing. Classic in appearance but quite ingenious at a closer look, this French tip nail design is fresh and alluring. We love the mark design created at the base of the tips. 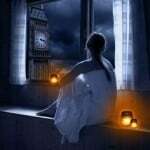 It’s innovative and interesting. Who says glitter has to be tacky? 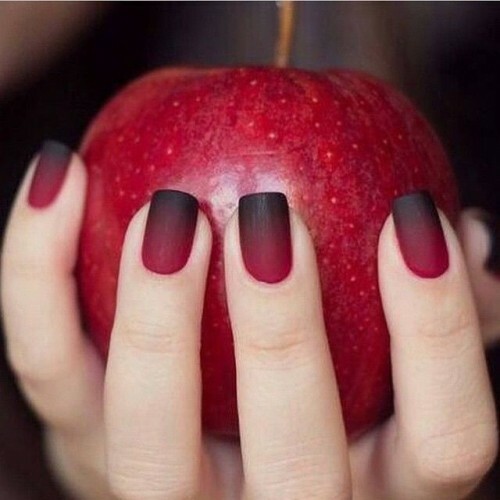 For this manicure, it is actually quite stylish. However, it’s fundamental to keep your nails short for this one. Too much glitter can do more harm than good, and you certainly don’t want to look cheap. This French tip nail design is Dita von Teese’s signature. The gorgeous burlesque dancer sure knows how to put on a show, even when she’s not dancing. We adore the manicure; it’s sleek and modern. French tips nail designs can be beguiling, and the manicure we’re presenting in the picture above is stunning. Classic in form, the color of the nail polish goes from really light pink to white. It’s such a delightful combination. Are you in the mood for a playful type of manicure? Well then you should definitely give this design a try. 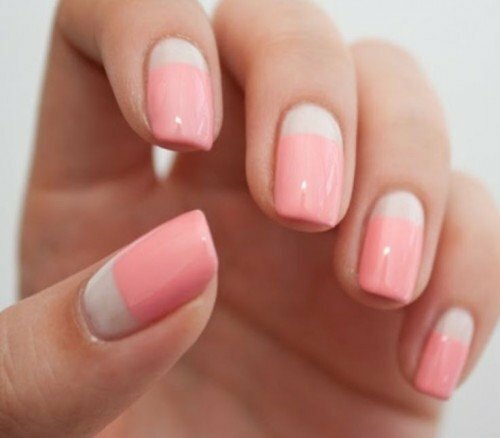 Square-shaped at the tips, and polished with a hint of bright pink, the French tip design is surely worth a try. 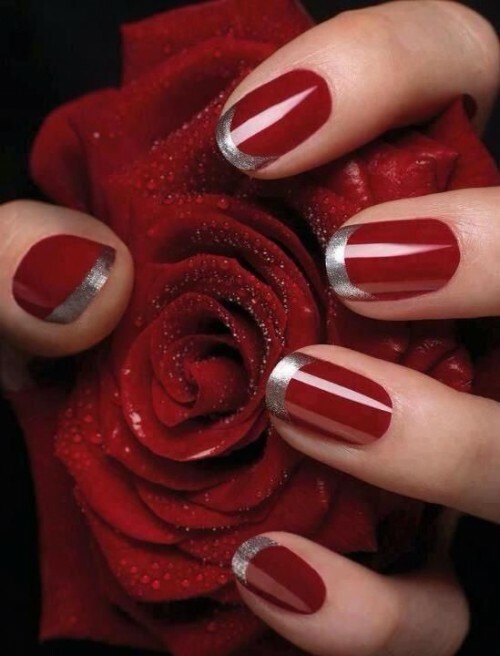 Women who are more romantic by nature will adore this bloody red French manicure with silver tips. Naturally looking and topped with an extra goat of invisible polish, the design is more suitable for a lavish party or extravagant formal event. 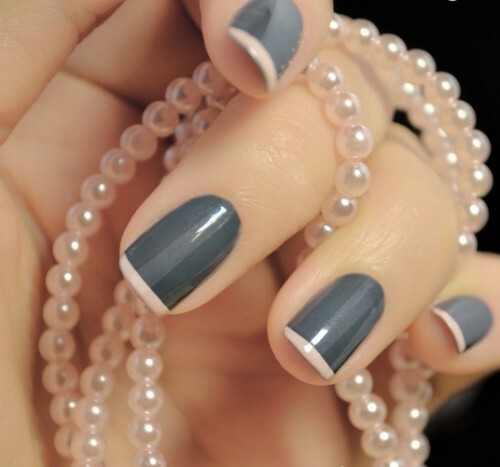 This classic type of French manicure will instantly grab people’s attention. 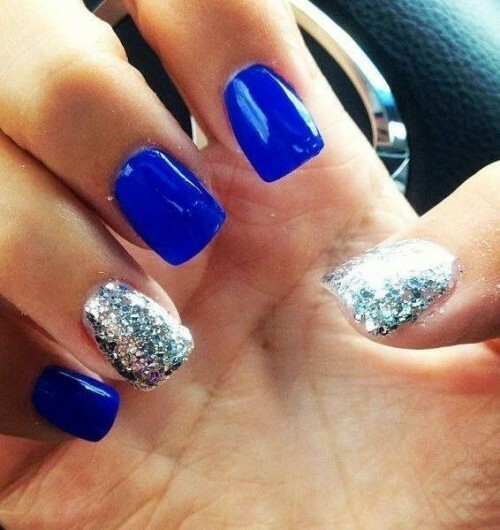 The navy blue mixed with the sparkles go really well together. Are you a free spirited woman who’s not afraid to take risks? 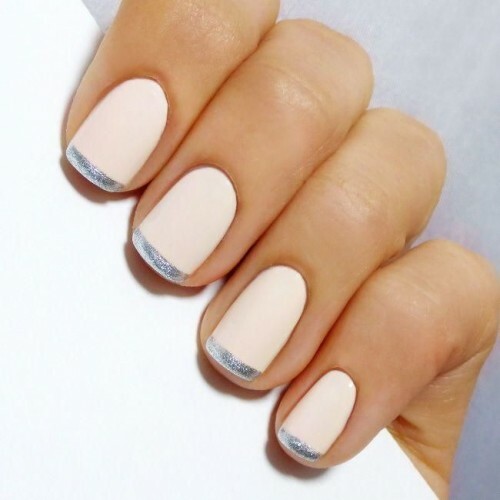 Then maybe you should give this French tip nail design a chance; the dominant color is light beige, which blends beautifully with the pops of color used for the tips. 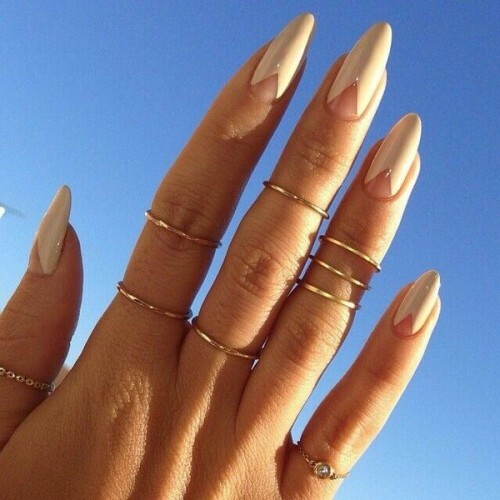 Pure white nails will never out of fashion. However, for this French manicure instead of focusing on the tips, all eyes are centered at the base. 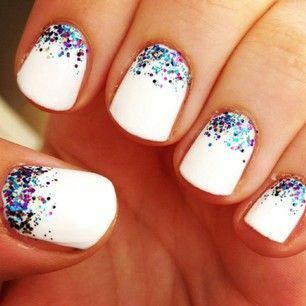 That colorful glitter puts a twist on the conventional white nail polish. Not all women can rock pointy stiletto nails. However, if you’re not doing the dishes every night, this French nail tip design will definitely wow everyone around you. 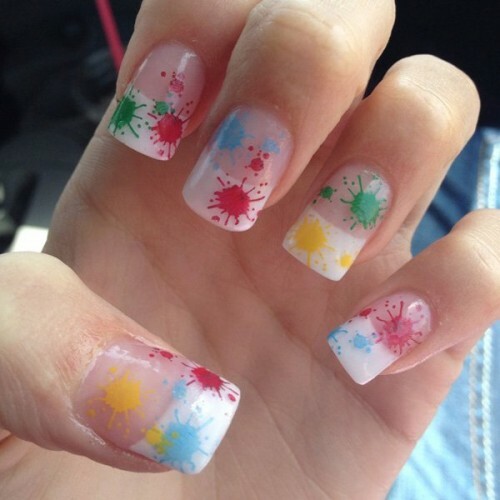 Fun, flowery nails are perfect for the summer season. The French manicure featured in the picture above is fabulous. Wear it with flats and a long, sheer dress and you’ll feel amazing at the beach. What more can we say? 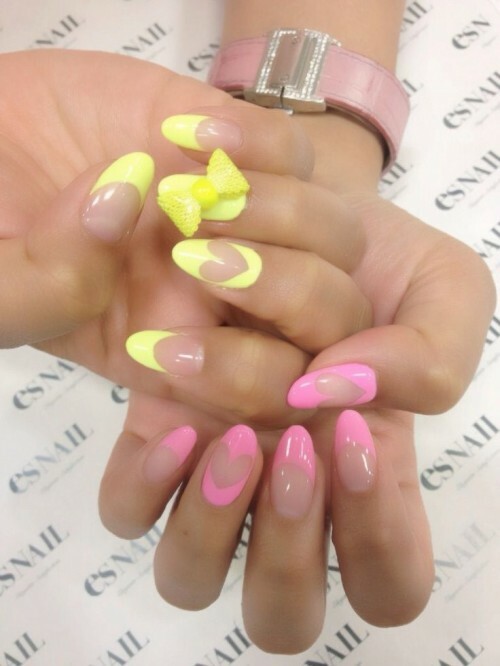 This daring combo of yellow and pink nail polish is exceptional. We love the transparent hearts too; they add originality to the whole design. 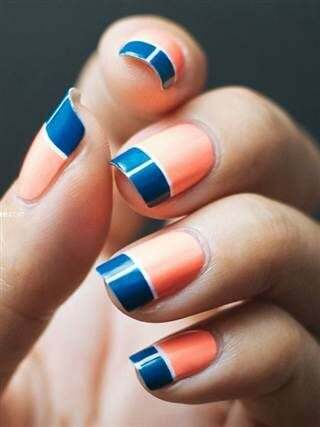 If you haven’t tried the color-blocking manicure before, now it’s the best time to give it a try. The blue and orange combination is magnificent; of course, you can always try different blends. Even in the smallest quantities, gold is a color palette that instantly grabs attention. 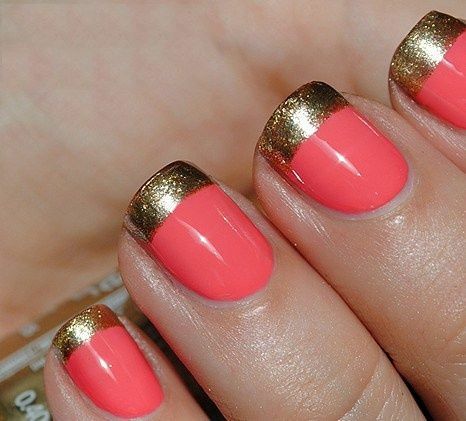 Opt for golden tips and pink nails, and the end result will blow you away. The French tip nail design is ideal for the beach, but also at a party or wedding. We talked about golden tips, so now it’s time to mention silver. The above French manicure is really discreet; yet it’s stylish and chic at the same time. Perfect for brides-to-be! Tuxedo nail designs are the hottest trend of the year. 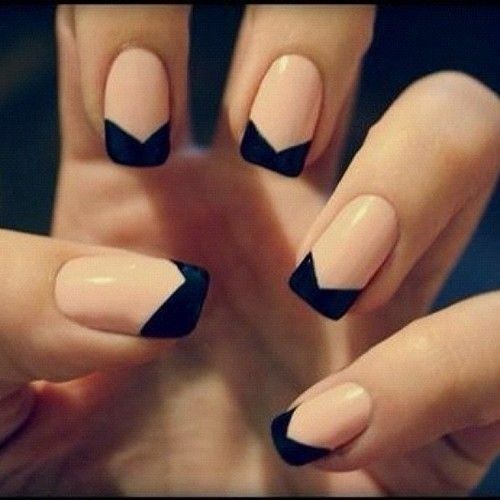 Opt for creamy beige and black for the tips, and consider acrylic nails for an added effect. Pastels are best color palettes for the summer season; they’re so fresh and enticing. 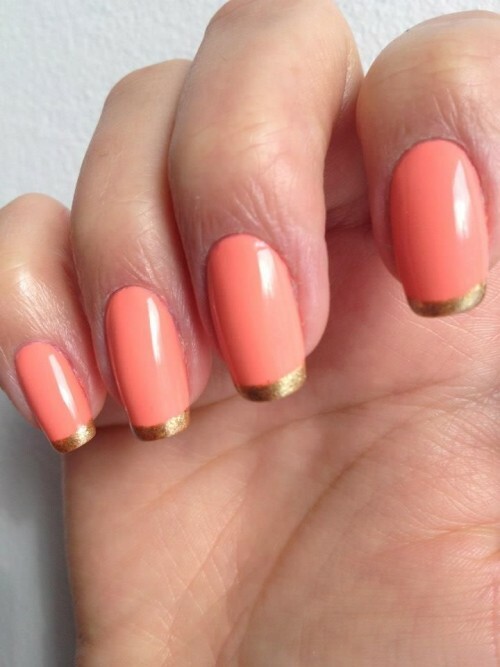 Consider this reverse nail tip design, which is lighter at the base and warmer at the tips. The pink and beige combo goes really well with all summer outfits. At a first glimpse this French tip nail design is a classic one. 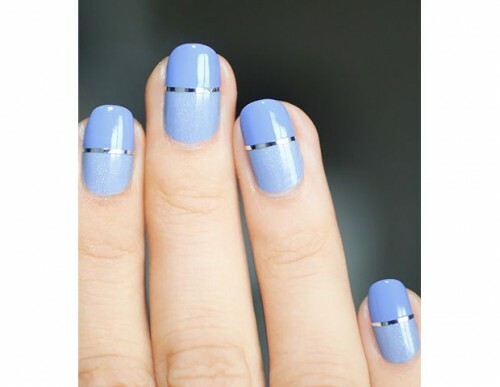 However, those silver lines attached horizontally halfway through the nail will beautifully compliment any silver rings you choose to put on your fingers. Peach with striking gold are a winning combination. The French tip design elegant and stylish, although it shouldn’t be matched with clothes or accessories that are too colorful or bright. The combo will become too striking, and you certainly don’t want to look like a walking rainbow. 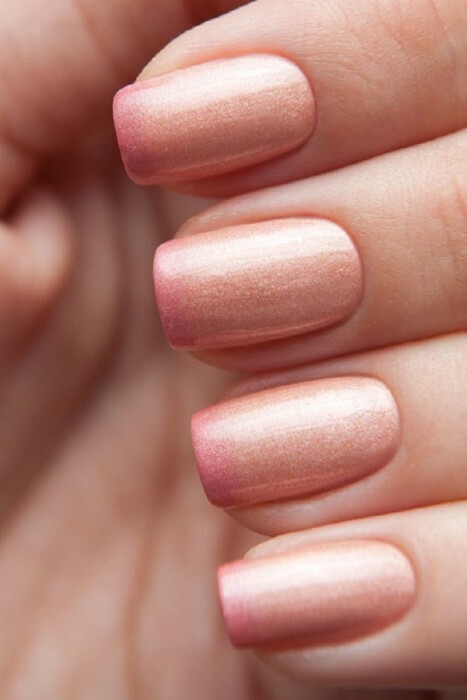 The pink-peach ombre effect created by the French tip nail design presented above is delicious. We love the coral effect created; it’s so chic and elegant. Perfect for every occasion, this blend of purple with golden-gray looks so expensive. Wear the French tip nail design with opulent jewelry, and be ready to make an unforgettable impression. This warm orange with black stripes looks fascinating, and it is mostly because of the unusual position of the stripes. We really like the effect created; it’s modern and outgoing, perfect for uptown girls ready to party at every hour of the day. You won’t be able to do much with those nails, but at least you’ll feel fabulous at any party or social event you’re about to attend. The design is spectacular, although it’s certainly tough to deal with on a daily basis. This classic French manicure would have been the simplest if it weren’t for those color splashes. The effect is fun and vivid, ideal for the hot summer days. 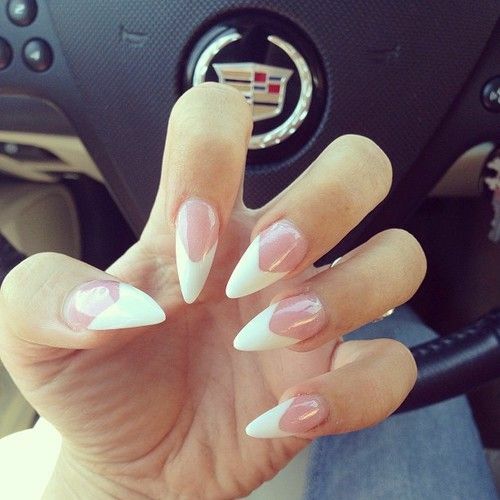 Not all women can make stiletto nails look chic and elegant. If you’re crazy about abstract designs, the model in the above picture will leave you speechless. 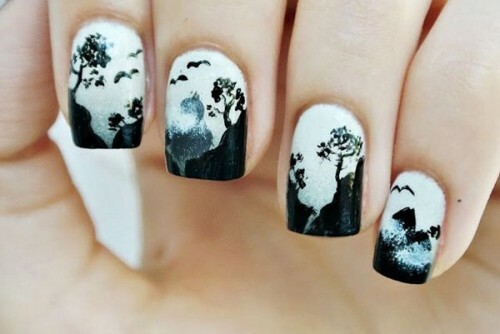 This beautiful black and white nail design with floral patterns is fabulous. The tips are square-shaped and a bit longer than the usual. Excellent French manicure for an extravagant party. Bring The Milky Way closer to your heart have it painted on your nails. 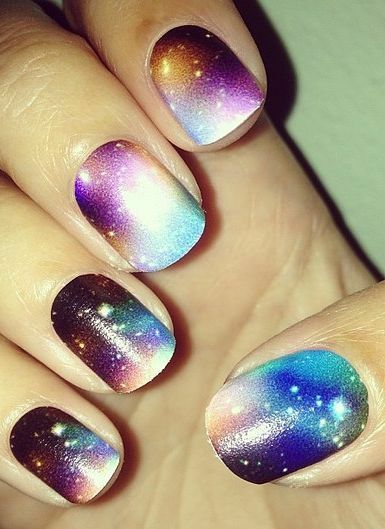 This Galactic French tip nail design is stunning. Shades of purple, blue and black go really well with the glittery accents. 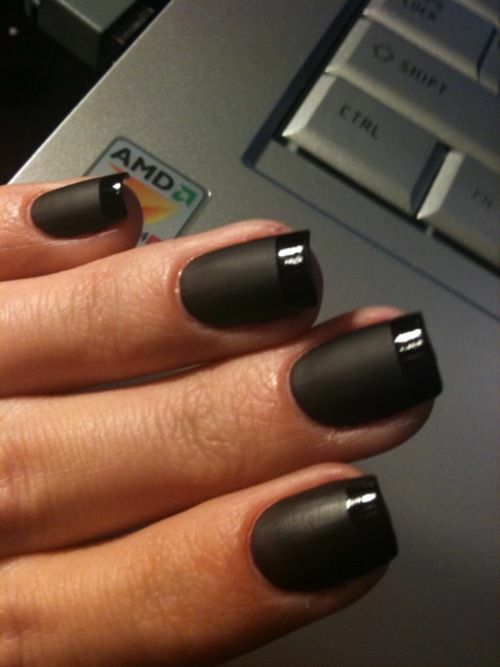 Matte black is the kind of nail polish you can wear with any type of outfit. 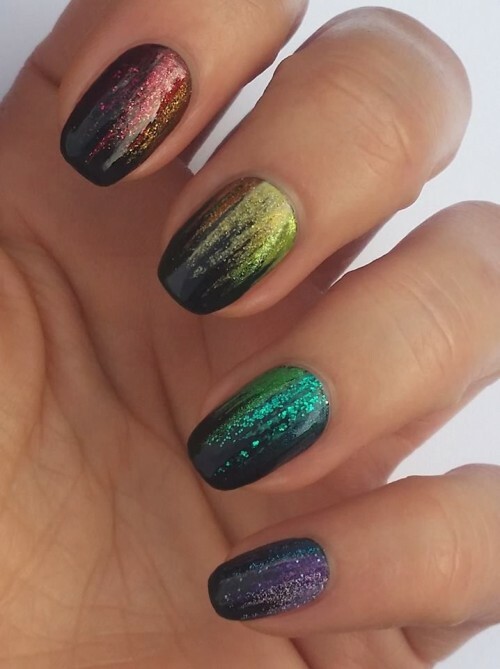 However, if you’re going to add a twist to the traditional black manicure, consider colorful glittery accents; they’re cool and interesting. 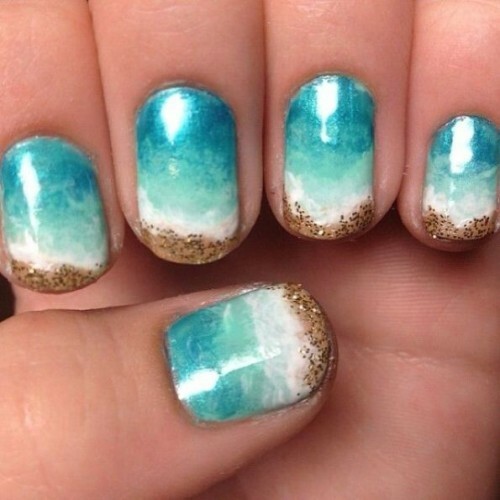 It appears that the ocean and the beach have been artistically put together in this fascinating French tip nail design. 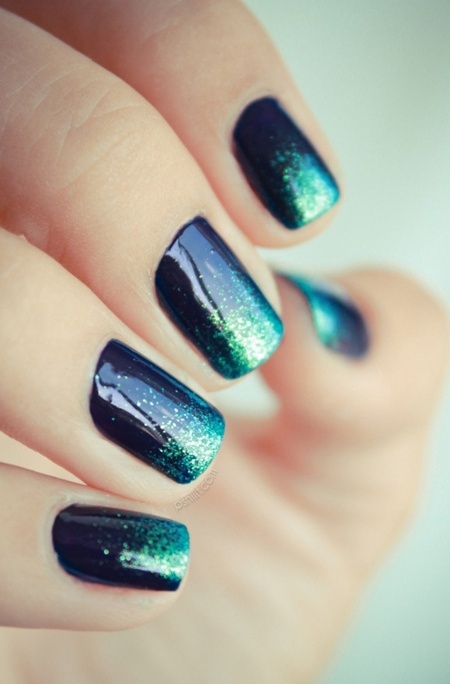 The fluid effect the manicure creates is spectacular; we really love the way the blue interacts with the white. How can you transform your manicure into art? 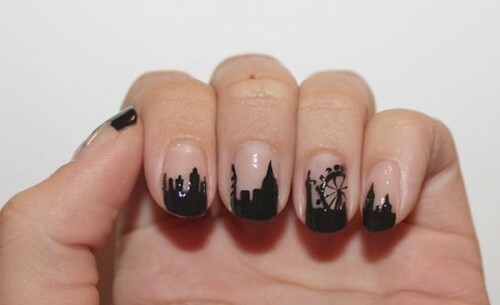 Simple, create a city outline with nail polish. We’re guessing in the above picture we have London emerging at the union of all 5 fingers. As far as nail design is concerned, we just can’t get enough of the glitter. In combination with black it shines, and it can transform the simplest outfit into something unique and chic. 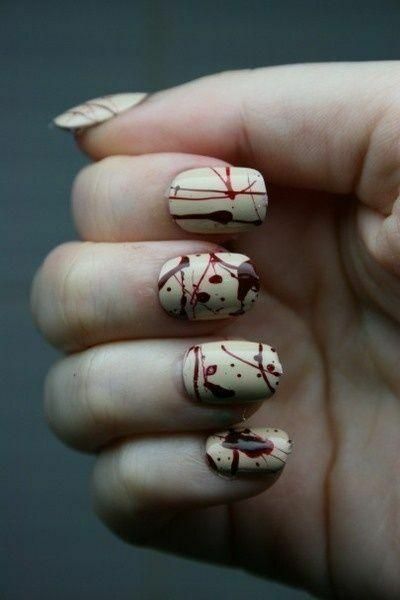 If you haven’t tried the zombie nail design before, now it’s best time to give it a try. 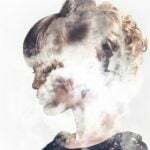 It may appear messy at a first glimpse, but if you’re an open-minded person willing to try new stuff all the time, then you have nothing to worry about. Having a maze painted on your nails is crazy. However, the idea does sound interesting too. Consider a black base and golden lines for the drawing; the end result will look incredible. 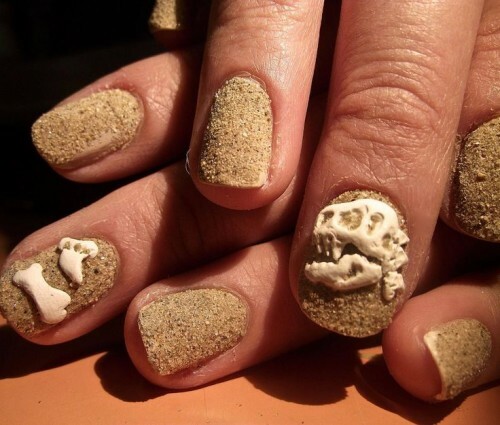 This sort of manicure is without a doubt one of the most insane we’re seen thus far. But if you’re the courageous type of woman who’s not afraid of a challenge, then you can give this a try. The archeology-inspired French design is more appropriate for a masquerade though. The marble design looks gorgeous on a white background. The nails appear to look broken, which is exactly what makes the style so ingenious and interesting. Pink nails will never go out of fashion. And since it’s summer, women around the world will want them. Just to add a twist to the classic French design, have yours edged in black. This color is absolutely delicious. Whether you have short, long, square or pointy nails, the simplest French tip design will make your hands pop up if polished with plum chocolate. There are so many different ombre styles available that it’s something difficult to choose as far nail design is concerned. 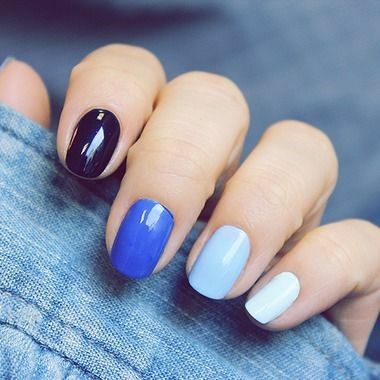 In the picture above, the French manicure emphasizes a specific color (in this case, blue) on each finger, from the darkest to the lightest. This classic type of French manicure is not something you see every day. Featuring a dark blue base and sparkling turquoise shades at the tips, the design is suitable for a really special occasion. Let’s put red and black together and we’ll have an explosive combination. 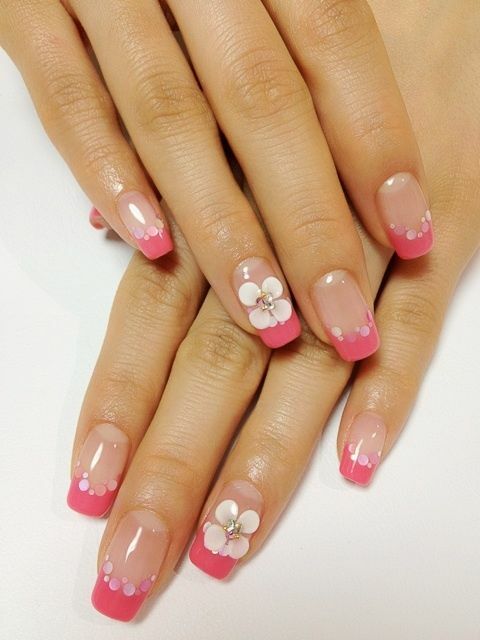 In this case, we have the most stunning French tip nail design. Keep the length of the nail as close to natural as possible, maintain the manicure looking casual yet attractive. Marsala is the trendiest color of the year. It is a darker nuance of cherry, just like the one in the above photo. The manicure is classic, but it does have those negative spaces to make it appear chic. 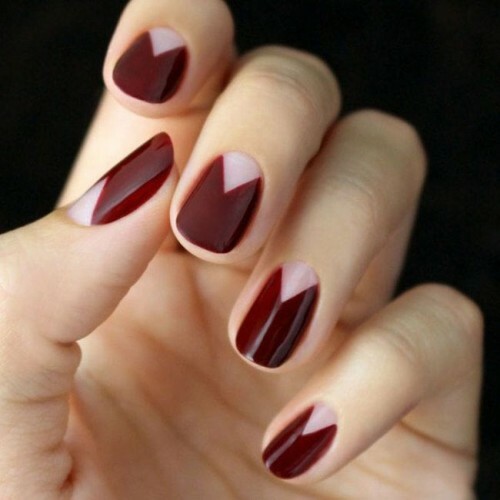 Burgundy is already a striking color for a manicure. 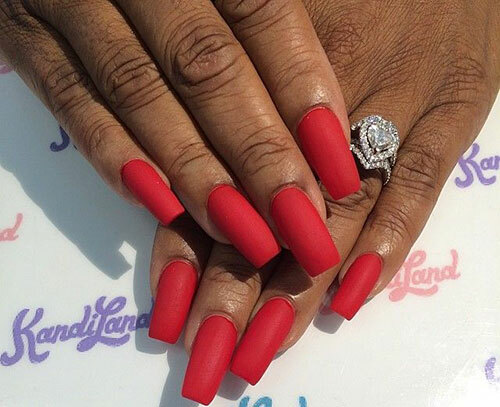 But since more and more women want to make an impression these days, it’s safe to say that this matte French tip nail design is everything you need to make that happen. This nail design doesn’t look cheap at all. 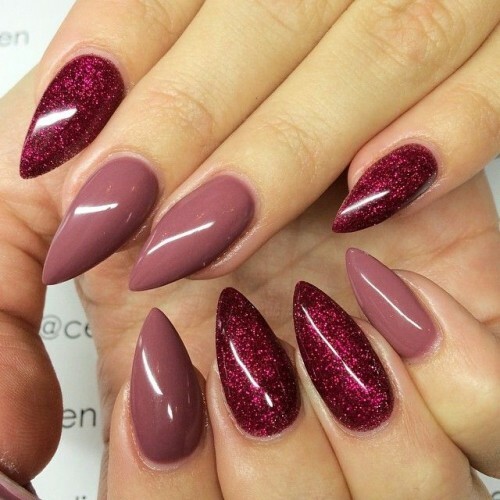 First of all, the nails are not overly pointy; they have a beautiful oval shape and they feature the warmest shade of pink. The negative spaces add structure and make the hands appear truly elegant. Negative spaces make women’s nails seem different. Apart from adding structure, they have the power to convert a simple, classic design into the most superb manicure. In the above photo for example, we have tiny black hearts inserted in the negative spaces. Now that’s ingenious don’t you think? 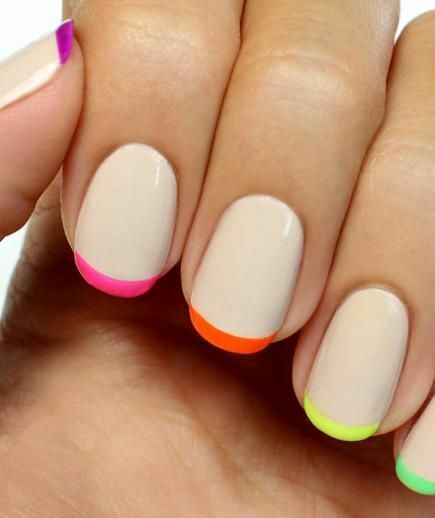 We’ve chosen 60 of the most amazing French tip nail design we could find. All of them are amazing and special in their own way? Which ones are your favorites?